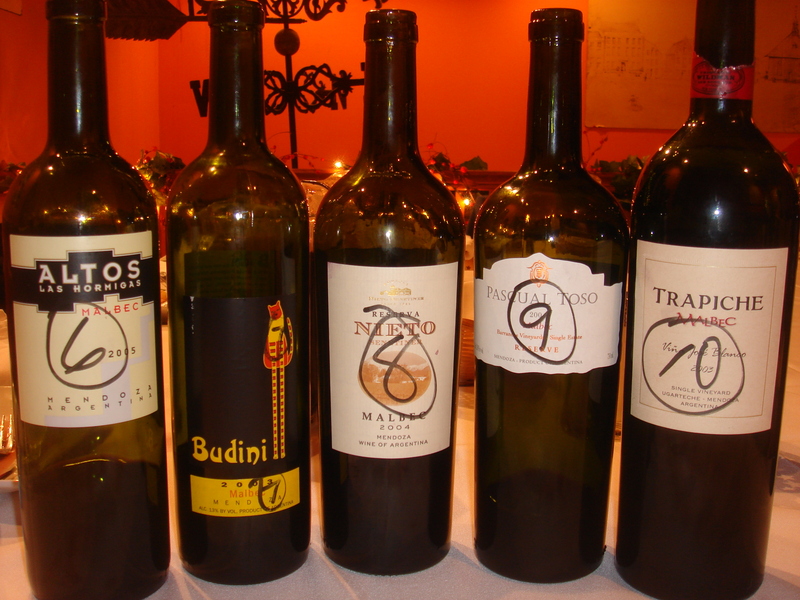 The WCC met to taste Argentine Malbecs. 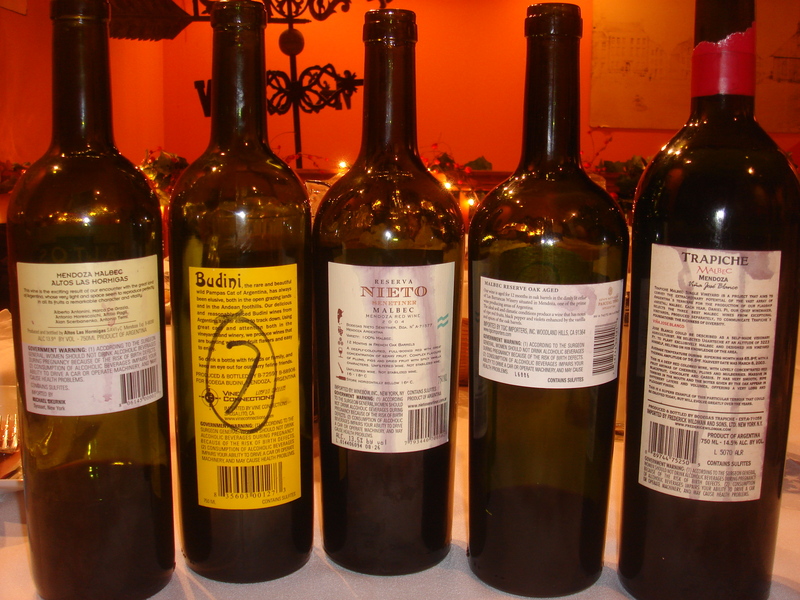 The wines were served non-blind in random order without decanting. 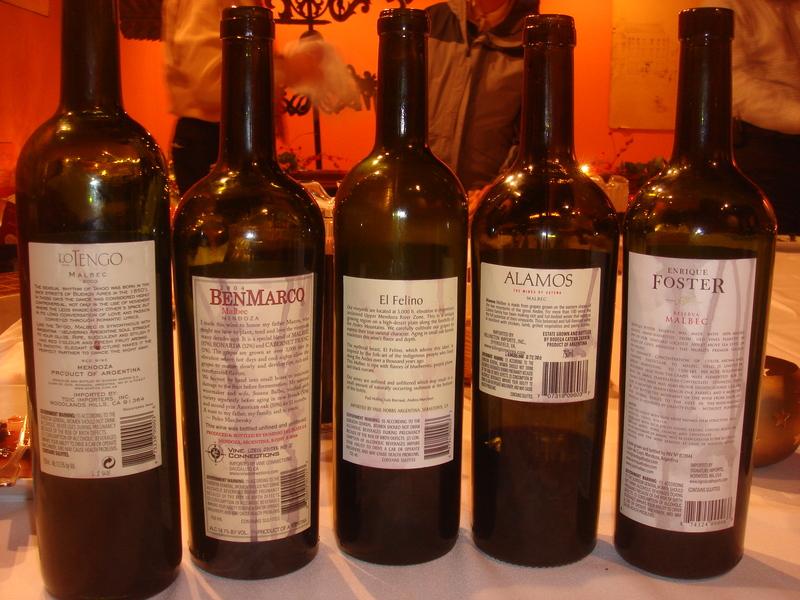 All wines were purchased locally, except for the 2 Foster wines which were bought by a group member in Argentina. 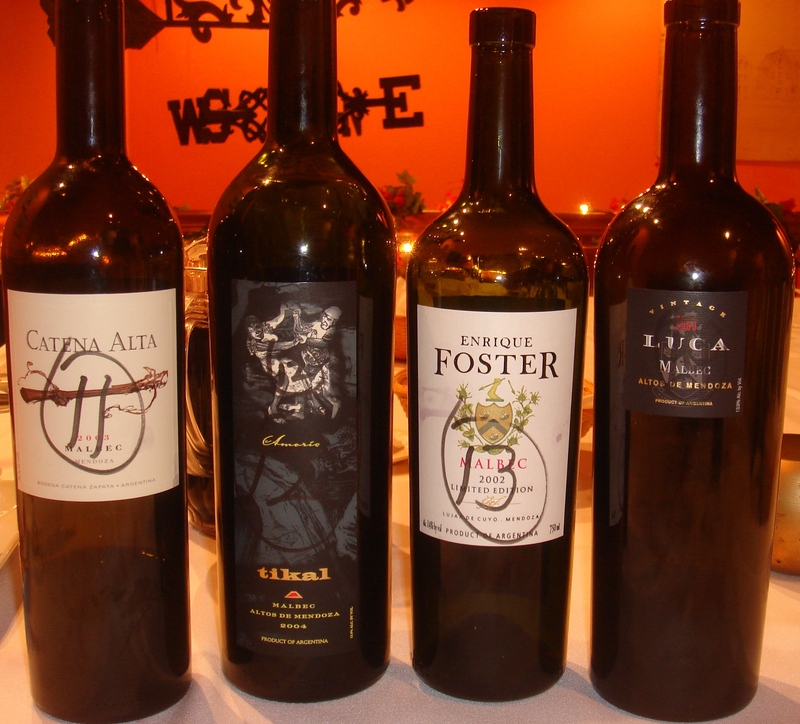 The US price of each wine is given after the name of the wine. 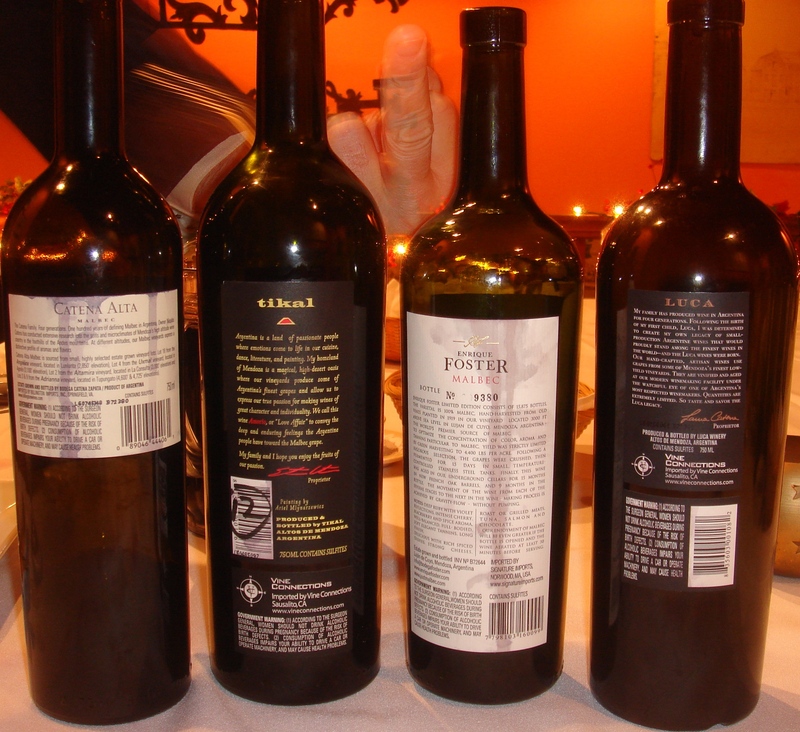 The wines were served non-blind because none of us knew anything anyway. I'm not sure how much I know now that I've tasted these. There was little correlation between quality and price to my palate, and because we had such a narrow range of vintages, I still have no idea how these wines age. [100% Malbec] Appealing nose of ripe red fruits, cloves, and orange peel. Thick, tart, tasty. Chewy tannins. 89 points. [12% Bonarda, 1% Cab Franc; winemaker Susana Balbo, wife of owner Pedro Marchevsky] Muted black raspberry nose. Smooth and ripe, but biting on the finish. 88 points. [100% Malbec] Smoky black fruit nose. Long, clean finish. WOTN for me. Great balance and length. 93 points. Click on an image with a border here for a larger view of that image. [100% Malbec] Smoky cherry nose. Sweet black fruit and biting tannins. Good balance, but needs time! 91–93 points. [100% Malbec] Bright fragrant nose of cherries and cedar. WOTF for me. 92 points. [100% Malbec] Muted nose. Ripe, thick, sweet. 88 points. [100% Malbec] Huge bright red fruit nose. Big, sweet, tannic. Excellent length and potential. My #2 WOTN. 92–94 points. [100% Malbec] Big bright red fruit. Thick, but simple. 91? [100% Malbec] Very thick and young. 89–? Points. [100% Malbec; Amorio means Love Affair ] Biting, delicious. Sweet finish. 89 points. [100% Malbec] Ripe, sweet nose. Good balance. 91 points.